A new parade has come to the Magic Kingdom in Walt Disney World this Spring. The Festival of Fantasy is both colorful and big! Every float has movements incorporated into its design. Things and characters swing, spin and expand as they follow the parade route through the themepark. All are impressive but none more than the Sleeping Beauty float. Sleeping Beauty float in the Festival of Fantasy parade at the Magic Kingdom features a Steampunk-inspired Dragon as the wicked Maleficent. The float measures 53 feet (16m) in length and 26 feet (8m) tall when the dragon is breathing fire. Nikon D700/24-120VR, 1/250s, f/8, ISO 200, EV +0.3, 50mm focal length. When the dragon reaches its full height and opens its mouth, fire comes out of it much to the delight of all the guests packed up and down the parade route. Sleeping Beauty float fire breathing dragon sequence during the Festival of Fantasy parade in the Magic Kingdom. To make sure I got eye-to-eye with the metal beast, I photographed the parade from the Main Street Railroad platform at the beginning of Main Street USA. 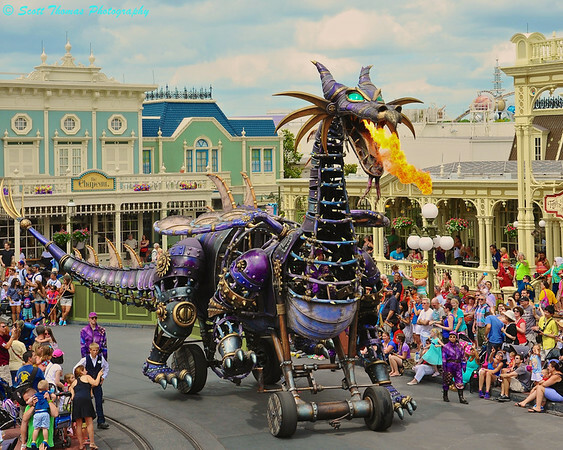 Steampunk Maleficent Fire-Breathing Dragon in the Festival of Fantasy Parade on Main Street USA in the Magic Kingdom. Nikon D700/24-120VR, 1/500s, f/8, ISO 200, EV +0.3, 82mm focal length. This float alone is worth the time to catch this new parade but it also has six other floats themed after the movies: The Little Mermaid, Brave, Tangled, Peter Pan, Princesses (included the newest ones from Frozen, Anna and Elsa) and, of course, those famous Disney characters Mickey and Minnie Mouse, Donald and Daisy Duck, Goofy and Pluto. To see more from photos of my recent trip to Walt Disney World, click here to go to my Disney Vacation Photography blog. 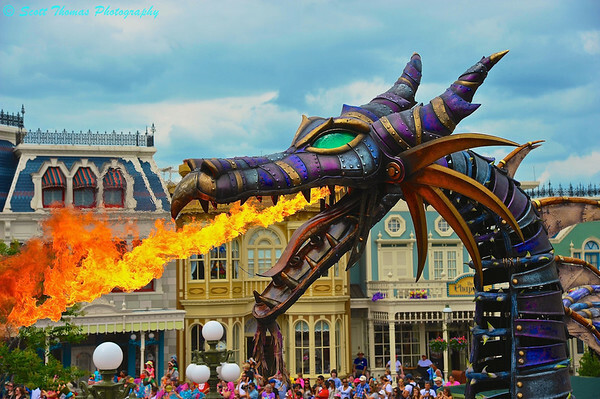 This entry was posted in Travel, Weekly View and tagged 24-120mm, breathing, dragon, festival of fantasy, fire, float, florida, magic kingdom, main street usa, maleficent, metal, nikon D700, orlando, parade, sequence, steampunk, vr, walt disney world. Bookmark the permalink. Disney really went all out for the new parade. What great shots of this creature, Scott! I am impressed. Hope you are having a great holiday weekend. I am, Kathy. Weather if finally very Spring-like here this weekend. Maleficent was a favorite drawing subject of mine when I was a teenager. This steampunk version of her dragon incarnation is just great. It seems ‘reasonable’ to me that a fire-breathing creature would be made of metal. Scott, you’ve managed to capture her in such good light, revealing all the textures and details in the metalwork.